My first ever Festival was at the final year at Crossroads (Yass). Alfar and Gudrun were King and Queen of Lochac, having followed Draco and Asa. There was a story line going on where Draco and Asa were trying to reclaim the throne. It was so much fun for us newbies to see such theatre. I had been in the SCA for a matter of months. Festival was my second ever SCAdian event. 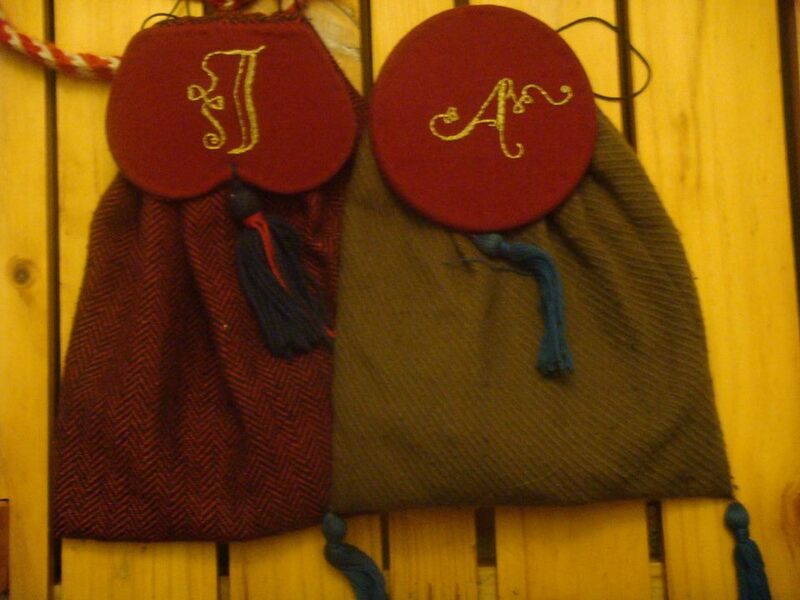 Mistress Portia was tasked with organising the creation of a personalised pouch for each of the Barons and Baronesses of Lochac, to be gifted by Alfar and Gudrun during their reign. Mistress Portia designed the pouches and researched the shape of the lids. Two broad categories were defined; kidney shaped lids for earlier period personas and circle lids for later period personas. The pouches are made of a wool base. 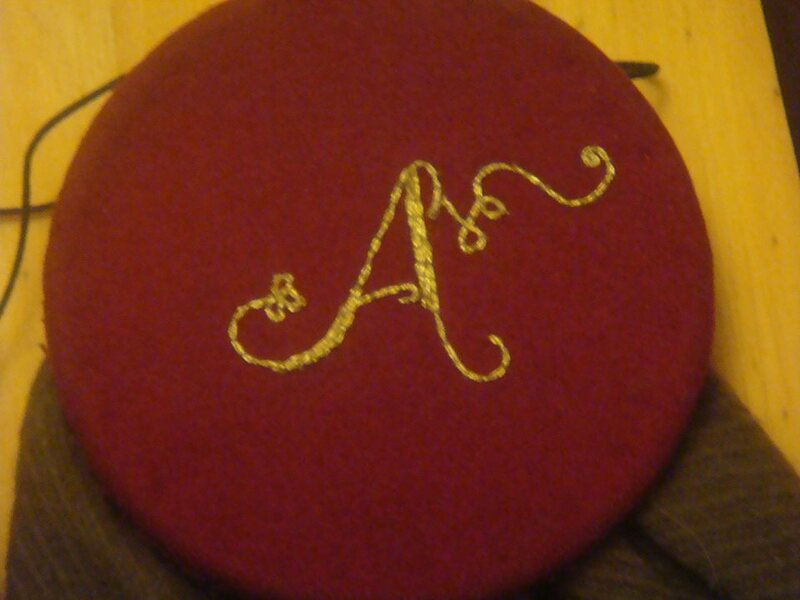 Portia also selected the font for the letters I was to embroider; an A for Baron Alessandro and an I for Baroness Isobel of Politarchopolis. 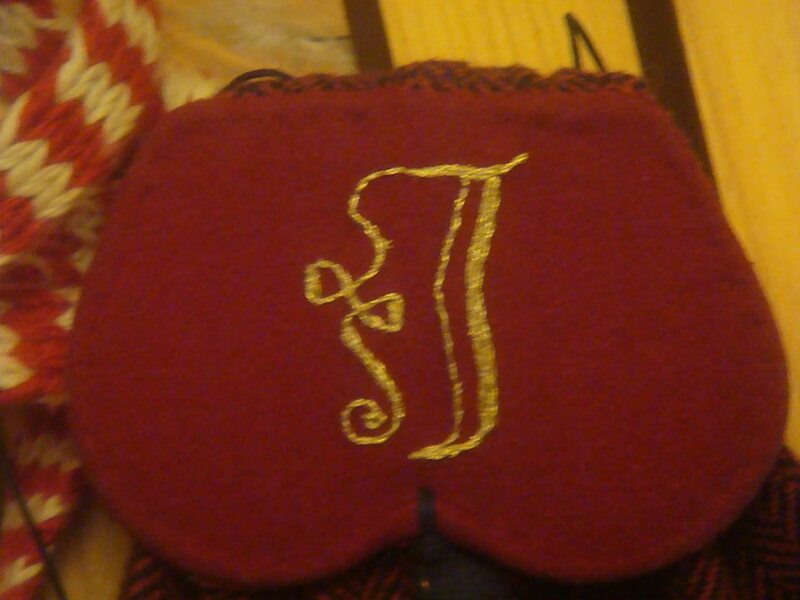 So, for my first ever embroidery project I couched gold twist onto the woolen lids. I offered to help, even though I didn’t know how to embroider yet, and was given the Politarchopolin pouch lids to embroider (in case they didn’t turn out so good and we could redo them later, being close to home). I had no idea what I was doing, but they turned out okay, regardless, and didn’t need to be remade after all. I was also responsible for assisting with the last-minute eyelet hole sewing for some of the pouches at Festival itself.